If you’re like most people on LinkedIn, one area you can improve on is increasing the number of quality connections you have. The good news is that if you follow the 5 simple steps I’ve outlined below for just 15 minutes a week, you will quickly grow your LinkedIn connections and develop a robust network you can be proud of! The benefits of developing and nurturing a quality network can’t be overstated. Your network may help you if you’re in sales and want to leverage trusted relationships to get a foot in the door. It may help you find your next career. It may help you find a vendor to help you or your company. If you or your company start blogging, it also provides an audience to share your content with. Growing your LinkedIn network with quality connections can do nothing but help you and your career. Completing these simple steps will make that a reality sooner rather than later. 1. Add A Recurring, Weekly 15 Minute Appointment To Your Calendar. 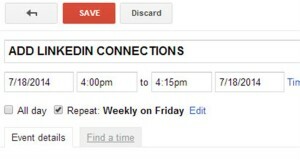 Go to your Outlook, Google or other electronic calendar and create a recurring weekly, 15 minute calendar appointment that says “Add LinkedIn Connections”. Schedule it on a day and time you will commit to each week. 2. Log in to LinkedIn and go to “People You May Know”. 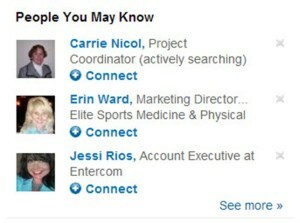 “People You May Know” appears in the upper right hand side of your LinkedIn home page. As far as I'm concerned, LinkedIn is the single greatest networking tool in the world - ever. The problem is, not everyone knows how to use it to their advantage. Of all the people I've talked to about LinkedIn, most acknowledge that they're a member but only a handful are actually getting value out of the networking website. Most signed up because a friend sent them an invite and haven't really given it a second thought since. The reality is, with more than 20 million business professionals on LinkedIn, you're missing out on countless business opportunities and the chance to build long-lasting relationships. Here are ten ways to get the ball rolling. 3. Grow Your Network Fast Expanding the size of your network is a snap. Aside from being able to easily import your entire address book from most email clients and automatically view who is a LinkedIn member, you can search for other members by companies you used to work for, people you used to work with, and people who went to school with you. In order to use LinkedIn to its full potential, you should have at least 50 first degree connections. Maintaining your online presence is more important than ever. If you want to be taken seriously by employers, clients, and other professional contacts, you NEED to give your LinkedIn profile a facelift. 4. Spice up your work experience by peppering in numbers. Quantify, quantify, quantify! You want to quantify your experience whenever you can. People like to see numbers. They like to see results, not just tasks. Created, implemented, and managed 2+ major content initiatives annually, notable initiatives including the Happy Grad Project, which featured 35+ top career experts and acquired 4,500 new email subscribers within 30 days. See how that conveys results? Try it with your own work experience! 9. Don’t forget about the Honors & Awards section! Have you received any professional honors or awards? Showcase them! These are especially helpful if they relate to your major projects. For example, if you received an award at your job for a great project, make sure you showcase both the project and the award on your LinkedIn profile. It helps back up your skills and expertise in that area.